Longtime Wichita developer, Colby Sandlian was honored last month with a lifetime achievement award for his work in the local and national real estate industry. Sandlian, owner of Sandlian Realty, received the award on November 30th from the Kansas Certified Commercial Investment Member chapter, and the Wichita State University Center for Real Estate. At 74, Sandlian is one of the city’s most accomplished real estate professionals, having developed everything from strip centers and service stations in the 1950’s to developing self-storage facilities in 22 U.S. cities. Sandlian says the award means a lot to him because it comes from people who he’s worked with and competed against throughout his career. “To get an honor like that from your peers is always very good and makes you feel good,” he says. The Kansas CCIM board chose Sandlian. Stewart says Sandlian was one of several people considered for the award. He says next year’s winner is already chosen, and he has a good idea who will be the winner in 2007, as well. He declined to name who the winners will be. Sandlian is widely regarded as one of the originators of the self-storage industry. He built some of the country’s first self-storage facilities in Wichita and moved on to other cities in and out of Kansas. He sold his Wichita properties in 1983 and now focuses the majority of this time on managing the facilities in other cities. His company, which no longer includes brokerage services, employs about 200 people throughout the United States, including staff at each storage site and several management groups. 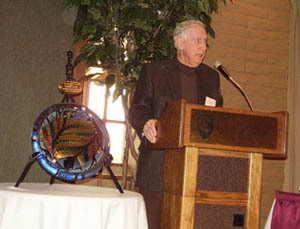 Sandlian also is known for his work on development along west Kellogg. He developed land for West Haven Cemetery and K-Mart, among others. He had perhaps the biggest impact, though, through a class he developed and taught called Broker Estate Building. The class helped brokers learn how to keep and invest their money, says Darrell Leason, owner of Darrell H. Leason, Realtors, who has known Sandlian since they were both 15 years old. “A lot of brokers work their entire career making a lot of money for clients and end up not having done the same thing for themselves,” Leason says. Sandlian, former president of the Wichita Area Association of Realtors and the Society of Exchange Counselors, says despite his age, he’s not ready to throw in the towel. Mr. Sandlian is the first recipient of this award.